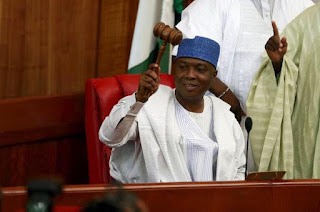 Senate President, Bukola Saraki has blasted all those who claimed that he has plans of switching from the All Progressives Congress (APC) to the Peoples Democratic Party (PDP) describing them as his political adversaries. He urged those making such desperate allegations to remember that he willingly left the PDP on matters of principles when the party was in power. According to him, “it is just cheap blackmail by political adversaries who want to call a dog a bad name in order to hang it. And those making such desperate allegations should remember that I willingly left the PDP on matters of principles when the party was in power. Is it now that the party is out of government and in opposition that I will now return having worked so hard for my party in the last general elections,” he queried. Saraki said he remains committed and loyal to the All Progressives Congress, pledging to contribute his quota to building the party and helping it to deliver its promise of change to Nigerians. He urged all members of the National Assembly to put politicking behind them and settle down for the proper business of legislating. He expressed his preparedness to embrace every member of the Senate regardless of their political leanings in the leadership elections just concluded. He also commended Buhari for remaining steadfast in his commitment to the principle of non-interference in National Assembly politics, even in the face of great pressure on him to act otherwise.